The Historical Bridge Inn in of Oley is located is part of the 461 acres the immigrant Johannes Yoder acquired from William Penn on March 25, 1714. Isaac Yoder and his wife Lydia the Inn built prior to 1848, 4 yrs before Covered Bridge was built in 1852. 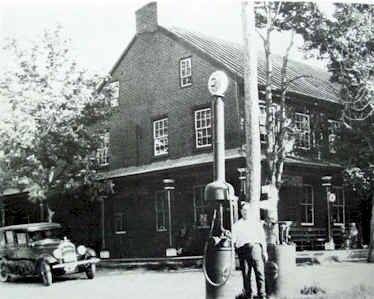 The Bridge Inn at Pleasantville was one of five hotels situated along the Oley Turnpike at the time the toll road opened to the public, and is the only one remaining in operation. The present appearance is quite different from the original brick structure that greeted customers in 1948. The Inn operated as a speak-easy during prohibition. Teofiel and Emma Stepsie bought it in 1979 with their daughter, Marsha Moser. After their death, their dream of creating a warm and hospitable Inn continues with her family and her staff for 33 yrs, Marsha Moser and her family than decided her nephew Brian Favinger should continue ownership of the Inn with partner Dan Sickafus. Marsha Moser continues her restaurant experience with the Creekside Pleasantville Diner in Oley, that offers a great breakfast and the Woods Restaurant on rte 73. Brian and Dan then decided to purchase the Inn to keep the history of it going and to strive to offer the best experience it can to a new country inn with a City flair. The Inn has in the last five years been offering a variety of different features such as ahi seared tuna, hand breaded calamari, vegetarian dishes, hand cut steaks, fresh baked desserts, and specialty cocktails made with fresh fruit, herbs and muddled vegetables that make up the extensive martini menu. Original baseball uniform of Pleasantville.